It was a lovely Sunday afternoon. 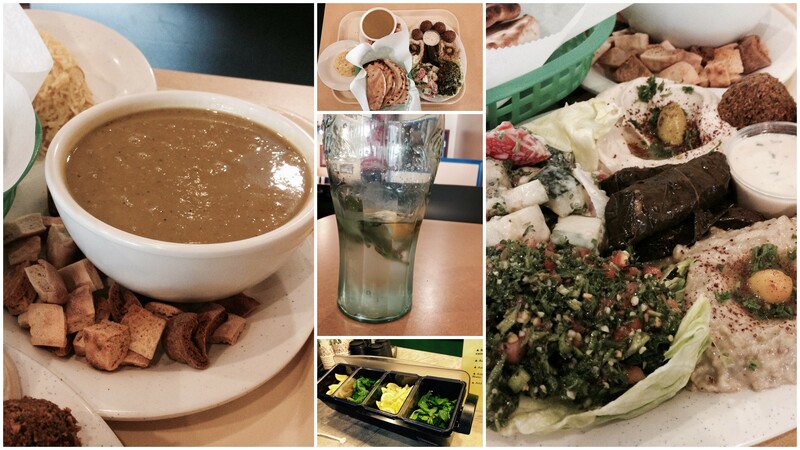 We happened to be in Sandy Springs, and lunch was beckoning. 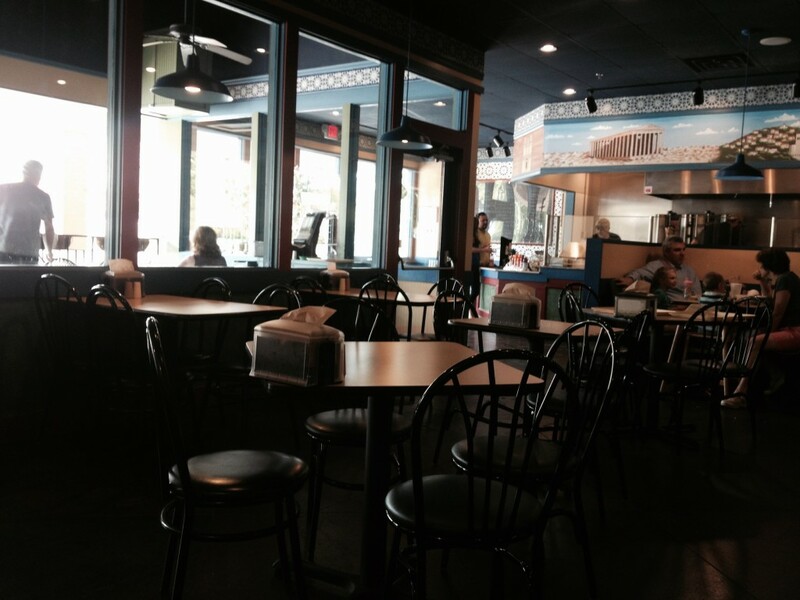 P suggested we go to Aladdin’s Mediterranean Grill & Deli on Roswell Road. I enjoy Mediterranean food, so off we went. It has been a long time since I have eaten at a restaurant and enjoyed the experience so immensely, PLUS I managed to get a few good photographs (thanks to the gorgeous light and the wide windows at Aladdin’s), so I thought a blog post was merited. The menu is fairly simple at Aladdin’s. I wish I had clicked a shot of the blackboard with the handwritten menu. There are many vegetarian options. P had visited Aladdin’s earlier for an office team lunch, so he ordered for both of us. It was simply wonderful. The flavors, the freshness, the vibrancy of ingredients, the casual atmosphere… the trio of giggling kids at the next table, their serious-faced parents (Mom looking every bit stylish and Middle Eastern, as I’d imagine) and the Arabic music playing in the background – all in all, a supremely relaxing and delicious lunch experience. Let’s take a moment to talk about water? How adorable, right? Giant glass tumblers filled with cool water, a dash of rosewater, fresh mint leaves and lemon slivers make for a refreshing beverage. We ordered a bowl of Lentil Soup and the Vegetarian Platter. The lentil soup was simply flavored yet hearty in taste and texture. It came with a generous portion of pita croutons. I would have happily dumped the whole pile of croutons into the soup and slurped it all down, but I controlled myself… Sigh. The Vegetarian Platter contained: Baba Ghanoush, Tahini sauce, four Falafels, Dolma, Jerusalem Salad, Tabouli and Hummus dip. Can I just say that every item was delicious? It’d make for such a hackneyed description and a boring blog post but I think you understand my drift? These are the same dishes that grace the menus of most (if not all) Mediterranean eateries in the U.S., yet the freshness of the ingredients and the simplicity of preparation made for a delicious lunch repast. I wasn’t planning to eat the pita bread but their pillow softness was so tempting that I couldn’t resist. Made myself a generously loaded pita sandwich. The Tabouli salad was loaded with fresh parsley and lime (or lemon) juice with none of the mouth-puckering sourness. The Dolma was perfect. I am not the biggest fan of this stuffed vine leaf preparation but I enjoyed it this time. I turned down dessert but I will give it a try next time. 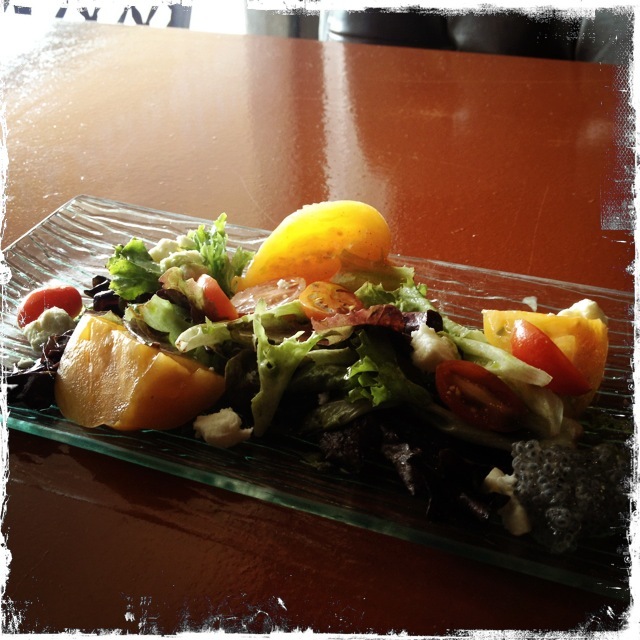 I came to know about Five40 Kitchen and Social House a few weeks ago. The menu sounded hip and interesting even though it had only a handful of vegetarian options. The website is minimalist in design. (Some would call it ‘sparse’). 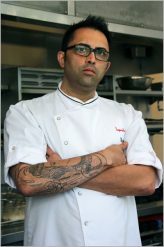 And the chef Bhavesh Patel is of Indian origin. Plus, best of all, it is very close to where I live. Made plans to go with others but none materialized. Finally, I decided to brave the horrible lunchtime traffic on Barrett Parkway and go to 540 Tapas all by myself for a weekday afternoon meal. That plan finally came to fruition today. I had contacted the chef earlier to let him know that I wished to write about 540 Tapas on this blog. So he knew beforehand that I’d be coming. When I entered the restaurant, I was greeted by Dipesh, the bartender (I guess). I told him that I didn’t drink alcohol and asked if they had any non-alcoholic drinks on the menu. They didn’t have any but he offered to make one for me. 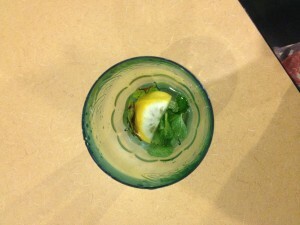 I asked if he could include ginger and mint. Soon enough, a slim glass appeared on my table. 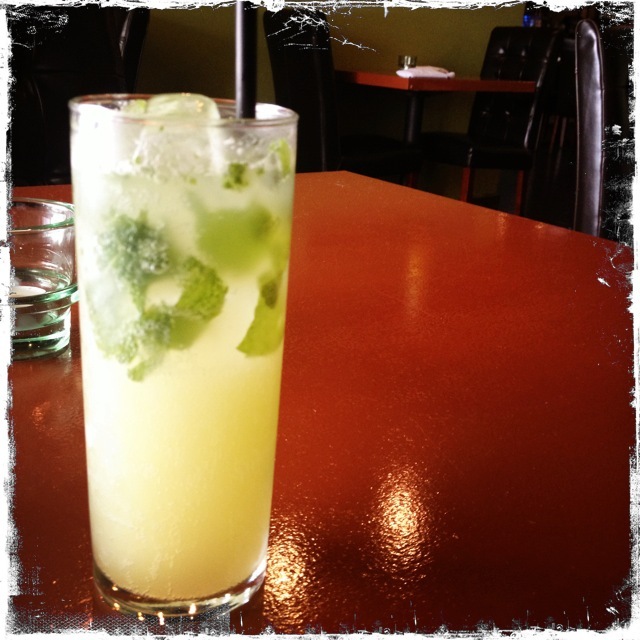 Fizzy and light, my special drink featured sharp ginger ale and fresh mint leaves and a bunch of ice cubes. It was tangy and spicy, hitting all the right notes on a dull day. I hardly ever order drinks at a restaurant (not even the non-alcoholic kind), preferring to stick to a glass of regular water, so this was a new experience for me. I would have liked to order the Orchietta (short rib, butternut squash, truffle butter, mushrooms), sans the short rib. However, I was told that that the sauce is meat-based. Ahh, well… sounds like a delicious combination! The soup of the day was a cold tomato gazpacho. Didn’t feel like the right day for a cold soup, hmmm. Finally, I asked for a Kale salad with lemongrass honey, star anise and orange and an Heirloom Tomato Salad with basil oil, basil seeds, smoked tomato and mozzarella. 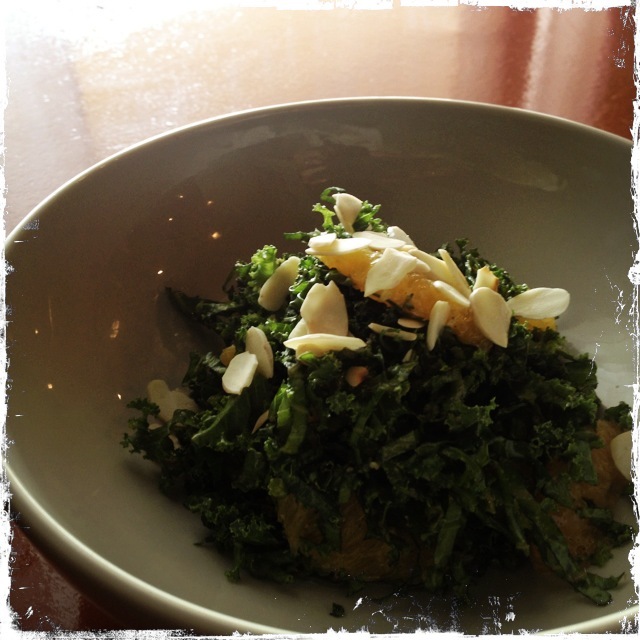 The Kale salad is a nice, medium-sized bowl of finely shredded kale and orange slices, laced with a sweet-tangy vinaigrette and garnished with almond slivers. I wonder if the sweetness of the vinaigrette owed itself to the lemongrass honey. A tad too tart for my taste, I thought. But the kale had a great crispness to it. Wasn’t tough, wasn’t soggy, wasn’t inordinately leafy. I couldn’t detect any anise flavors in the salad, though. 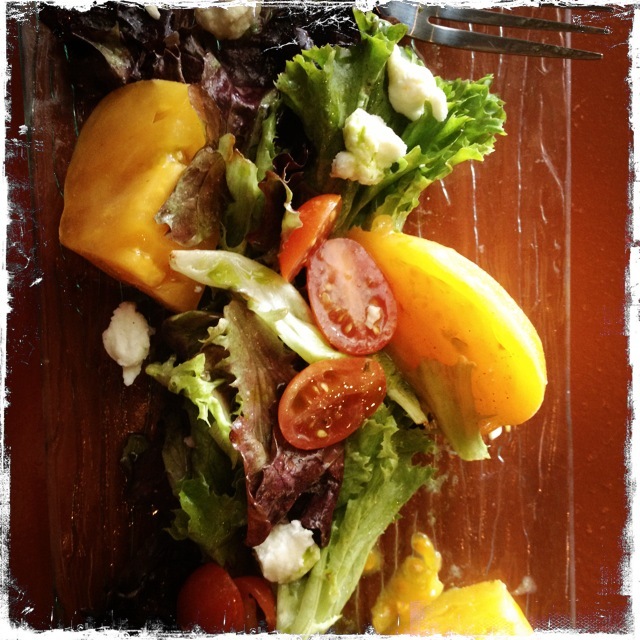 Adored the Heirloom Tomato Salad wholeheartedly. Smoked tomatoes have a slightly charred taste that is almost indiscernible. The salad featured regular mozzarella but I wonder if buffalo mozzarella would have been a better choice. Mixed greens, a dash of pesto (would have liked more of it) and a little pile of rehydrated basil seeds (gelee) completed the pretty picture. I asked him if the little pile of basil seeds is what goes as “takmaria” in India. Without batting an eyelid, he responded, “Yes.” The guy may not have visited India but he sure knows Indian food. I was suitably impressed. Not many people, Indian or otherwise, are necessarily familiar with these little chia-like seeds (also known as “subza”) that flavor cooling summer drinks and desserts in India and other parts of Asia. Couldn’t pass up dessert, could I? 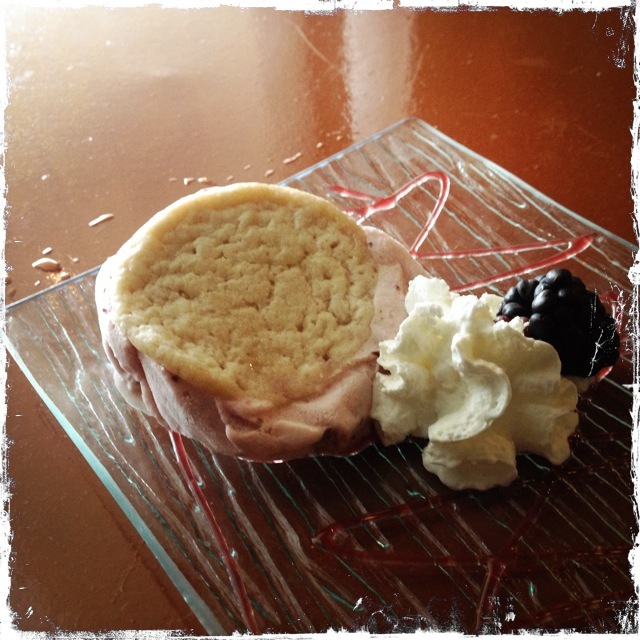 I opted for an strawberry shortcake ice cream sandwich. A nice generous portion that I wasn’t intending to finish… but I did. A perfect sweet ending to a good meal. The bill amounted to roughly $29. Not cheap by any standards, I think. I had a Scoutmob coupon that shaved $10 off the bill. Aah, well. 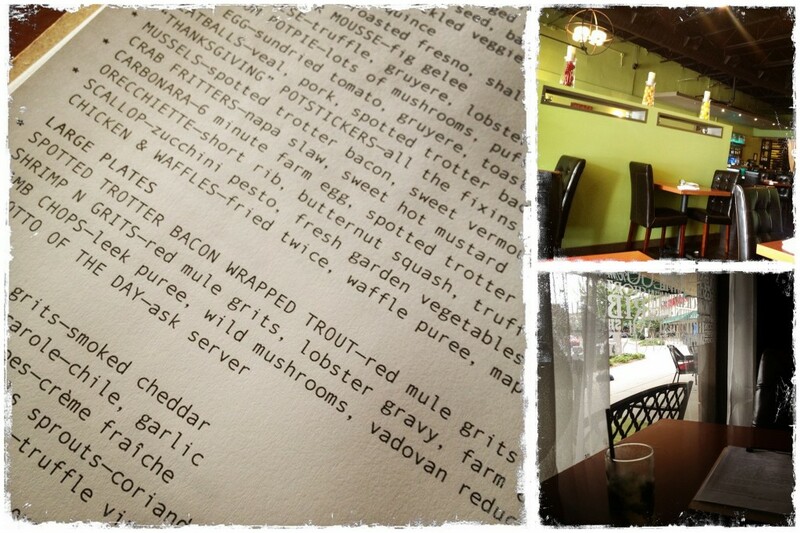 Hoping that Chef Patel will take my feedback and incorporate more vegetarian and vegan dishes on the menu!